Tic Tac Trance #028 Replay available! 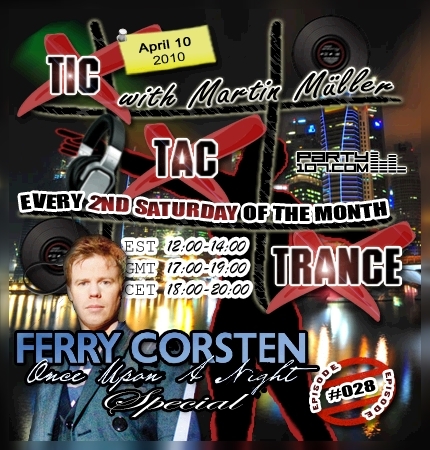 This month’s episode of Tic Tac Trance will feature several tunes which are included on Ferry Corsten’s latest compilation “Once Upon A Night”. My radioshow will be broadcasted on April 10 2010 on Party107.com and will also include tunes and remixes of artists like Josh Gabriel, Fast Distance, John O’Callaghan, Simon Patterson, M.I.K.E. pres. Plastic Boy, Andy Moor and many, many more! Don’t miss this melodic journey which starts at proggy 130 BPM and will end at over 140 BPM! My show will air today at 18 CET / 17 GMT / 12 EST. Check out your local time HERE!